This plug-in looks like a 10-band graphic EQ but it does much more than that. The old school engineers will recognise the added "Ambience" knob that adds incredible depth to the stereo field. When used on a stereo track or effects return it adds stereo depth and width to the signal being processed. So it is much more than a simple graphic EQ. 10-band EQ - Boost or cut from 12 to -12db at the fixed frequencies. 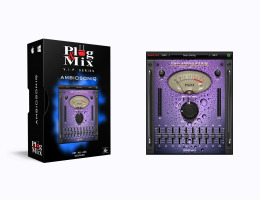 Ambisoniq Knob - Mix in the EQ sound with your dry signal for more width and tonal control.